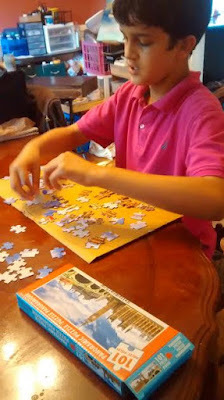 Blueridge Beauty Blogger: Life with Nathan...Puzzles!! This post will be short but the pictures speak louder than words!! My son, Nathan, who is 11 years old and 6th Grader, is officially into adult puzzles!! This is puzzle of Big Ben in London which is 100 piece puzzle which Nathan wants to put together all by himself with limited interruption by me, Mom. "Nathan, do you need my help?" I will asked him. Nathan said, "No!" 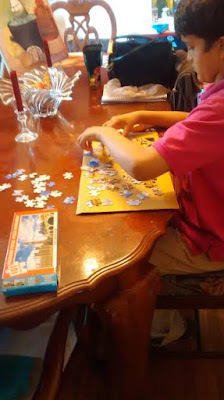 Doesn't matter that he may be fitting certain pieces wrong but that he is figuring out all by himself in complete silence! Someday, I hope we can see it for ourselves!